The report includes data from public Fortune 100 companies across many industry sectors. Meridian Compensation Partners, LLC is an independent executive compensation consulting firm providing trusted counsel to Boards and Management at hundreds of large companies. We consult on executive and Board compensation and their design, amounts and governance. Our many consultants throughout the U.S. and in Canada have decades of experience in pay solutions that are responsive to shareholders, reflect good governance principles and align pay with performance. Our partners average 25 years of executive compensation experience and collectively serve over 500 clients, primarily at the Board level. As a result, our depth of resources, content expertise and Boardroom experience are unparalleled. Meridian can provide custom market compensation levels and design data that is tailored specifically to your organization’s needs. 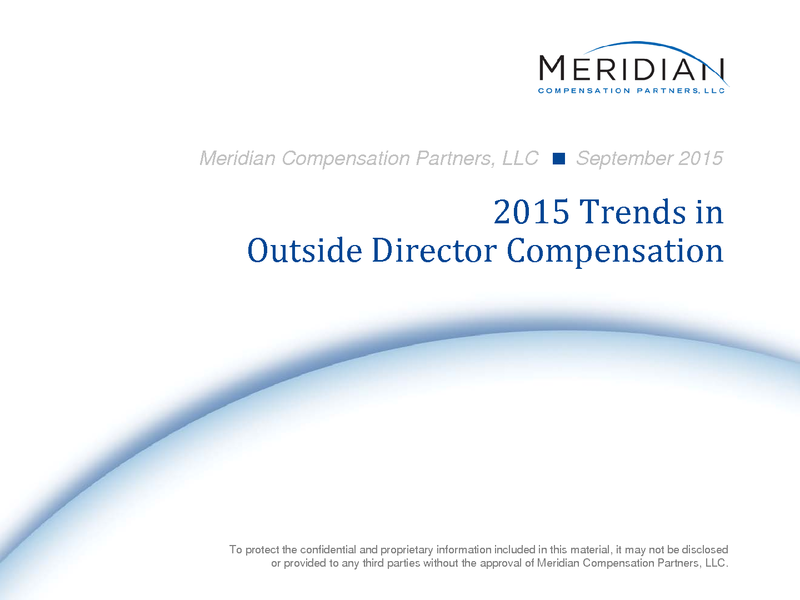 This includes building a customized report based on a specified group of public peer companies and/or all companies in Meridian’s director compensation database within a certain revenue range or industry. Contact Stuti Sehgal (ssehgal@meridiancp.com or (646)-737-1643) for additional information.